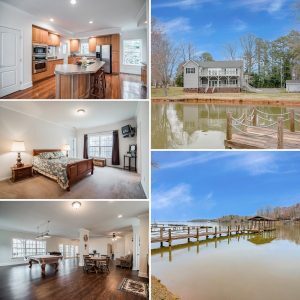 Water views from EVERY room … You’ll be amazed by this 3,300+ square foot turnkey home on an incredible lot. Start with the home: Bright, airy floorplan features gleaming wood floors, transom windows, and heavy moldings in the great room and dining area. An enormous center island and spacious cabinets highlight the gourmet kitchen with its stainless-steel appliances. Also on the top level is the master suite with garden tub, separate shower and a sitting room that opens to waterfront deck, perfect for coffee in the morning! The other level has a second living quarters, with great room, two more bedrooms, summer kitchen and covered patio. Outdoors is paradise: View the lake from both the front and back yard! Your private pier has electricity, plus a covered dock with slip holding up to 4,500 lbs. And 220 feet of shoreline just off the main channel! Other perks: Water-softener system, deep well, updates to HVAC, and no HOA.